Every year I set my easel up at various events and try to capture the atmosphere, the sound, colour and movement around me. 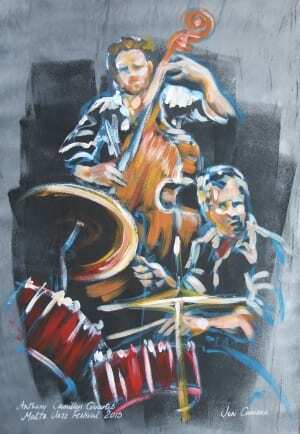 I have painted dancers and actors, circus acts and dog shows, but I like painting jazz musicians best of all. I think it’s because of the abstract qualities of jazz, the improvisation and unpredictability. Musicians become one with their instruments as the music carries them out of the everyday and into the extraordinary. 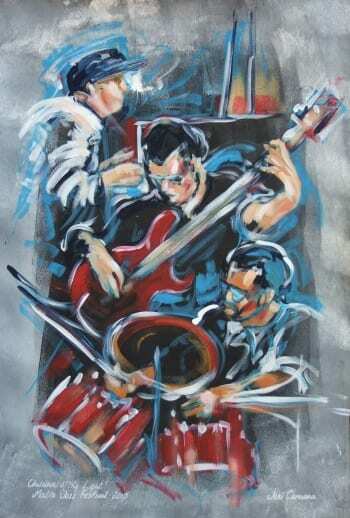 Jazz is a conversation in rhythm and sound – the communication and connection is palpable in the charged air. THAT’S what I try to paint….